Most people imagine retirement as a bittersweet, voluntary entry into elderly age, hobbies, and relaxation. Almost, just as it is depicted in TV, movies, and popular culture. If anything, retirement can be a stress inducing and difficult life transition. It can be difficult for retirees to suddenly switch from decades of working to a full-stop into doing a lot of nothing. It’s worse for people facing the aftermath of forced retirement, which is something I recently watched my uncle go through. Who’s At Risk of Forced Retirement? A recent research study conducted by Voya Financial revealed that more than 60% of American retirees stopped working earlier than planned. Or involuntarily. In fact, more than 33% of retirees retired involuntarily. About 16% of retirees had to leave work because of health problems. Well over 11% were fired or forced to retire. Over 6% of retirees left the workforce because of advancing age or to care for an ailing spouse. If you or someone you know was forced into retirement, like my uncle, you have options. A forced retirement does not necessarily mean the end of a working life. Or life. Here’s what you can do. I told my uncle to take a hard look at his savings. It’s important to know how much money is available on hand until things get better. Reentering the workforce at retirement age is not easy. It is essential to know what kind of financial buffer one has before trying to find work. Retirees may have to acquire new skills and training to get new work. As I advised my uncle, people can apply for Social Security benefits at the age of 62. Actually, you can apply for Social Security about three months before turning 62. Social Security offers modest supplemental income, but every new dollar helps. The average annual Social Security payout is $33,000. However, how much you receive depends on your age and work history. Make use of your prior skills and employment history. Apply for work on a part-time basis. Become a consultant. Teach part-time. Find some kind of work to keep yourself motivated and busy. A lot of people gain full-time work by starting as part-time employees. Use your decades of prior work experience to start out. Remember progress is a slow process. My advice to my uncle was to find part-time work or even volunteer, just to stay active. We all derive an identity and purpose for being from our work. I can’t imagine what it would be like to work for decades and then one day just stop. 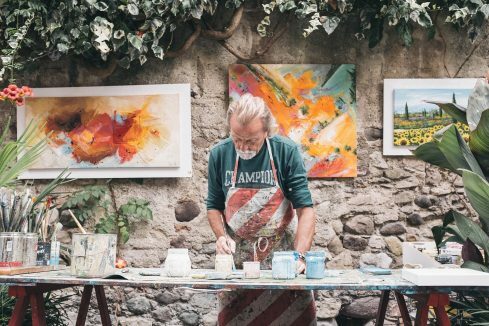 Many retirees have a hard time just hanging out at home and indulging in hobbies. Depression and anxiety affects many retirees who just can’t cope with the life transition – especially if it’s forced. Many retirees can’t afford to travel the world and indulge in hobbies full-time. Too many don’t have enough money saved and must reenter the workforce after retirement. If you have been forced to retire, consult a financial advisor. Carefully think about how you will fund your standard of living. Whether voluntary or forced, retirement is a life transition, not an end. Do you have any tips for dealing with forced retirement? Share them with us in the comments below!